Kogawa House writer-in-residence John Asfour leaves a trail of inspiration behind as he packs his bags to return to Montreal on Sunday, May 31. Final reading with Gary Geddes and Ann Eriksson on Saturday, May 30th. 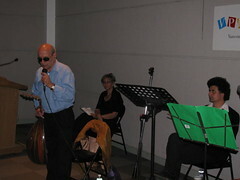 Geddes and Ann Eriksson join him for a final reading. I had learned in a whole year studying creative writing at university. personality” that characterizes the immigrant experience. Further information can be found on the website of the Historic Joy Kogawa House Society at www.kogawahouse.com or by calling (604) 263-6586.
involve students, other writers and members of the general public. 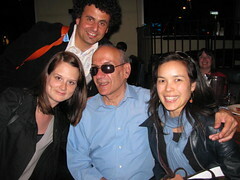 This entry was posted in Joy Kogawa & Kogawa House, Literary Events, Main Page, Upcoming Events on May 29, 2009 by Todd. 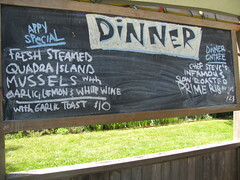 Eating on Mayne Island… 4 eateries… all delicious! Holidays and good food go together. We had caught the 7:20 ferry from Tsawwassen, so I ate dinner in the BC Ferry Restaurant, which is basically a mini White Spot. I had the bacon & cheese burger with fries… but substituted a soft drink for the frozen coffee drink that had a lot of mocha in it! Definitely better than Tim Hortons! At 7am, Friday, I woke up early and wanted to find a place for coffee and breakfast. Where do the locals go? It's the Sunny Mayne Bakery Café where I found delicious fried potatoes and scrambled eggs, which I ate with ketchup and HP Sauce. Perfect! They even make cappucinos and mochas too. I opted for plain coffee to which I added some chocolate, honey, and cream. Located in the town centre on 472 Village Bay Road, beside Tru Value Foods. Oh well, after burning up an appetite kayaking and hiking to Campbell Point, we headed to “Brickworks Restaurant on the Bay” at the Mayne Inn Resorts. The Resort is undergoing some rennovations, so it looks like it is closed from the street. But we drove in and found a lovely upscale setting. With a stunning view of Bennett Bay, we sat down and quickly ordered the special of the day, “Seafood Wellington” – salmon, haddock and prawns baked in puff pastry. At $18, it was large and reasonably priced. We cut it in two and shared it, along with the vegetables and rice pilaf. 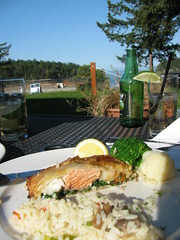 We sat on the remaining sun on the patio and enjoyed our dinner along with Strongbow and cider. If we hadn't already planned to spend the sunset hours on the other side of the island, we might have stayed longer. I was tempted by the $3.99 pub special of a chocolate shooter cup, filled with “your choice” of liquer…. We next drove to the other side of the island, back to the town centre at Miner's Bay. At 6pm, there was still a lot of time to fill before darkness fell, and on a small island there isn't a lot to do. Best thing is go to the pub! The good ol' hockey game was on the tv set, next to the pool tables. Detroit 3, Chicago 1. We went and sat on the patio, enjoying the wonderful view of Active Pass where we had seen orcas from the ferry only 24 hours earlier. The 3 people at the table beside us all ordered the $18 chipotle prawn special, and said it was very good. The other table had ordered 2 piece Fish & Chips and that looked good and was much cheaper at $11.99 We ordered the 3 piece for about $1.50 more and shared. We also ordered the Mission Hill white and red wines. What a wonderful way to spend a summer evening… restaurant hopping and having wonderful food. No Killer Whales were spotted, but the BC Ferries tooted their horns and passed each other in Active Pass. The Historic Springwater Lodge was originally built in 1892, and is the oldest continuously operated hotel in BC. It was stopping point for miners headed to the Fraser River and Caribou Gold Rush. that special Gulf Island charm, and the prices are quite reasonable. The shrimp soup with wild mushrooms was very nice, and our sandwiches were delicious. I had the smoked tuna clubhouse with shrimp and avocado aoeli. 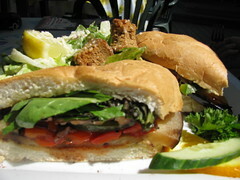 Deb had the vegetarian hoagy with ceasar salad. I think they were about $12 or $14 each. 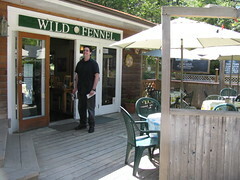 The restaurant is located at the Fernhill Plaza next to the Tree Frog Gallery, the Mackenzie Gallery of Fine Art and the nice store with all the glass work and pottery. 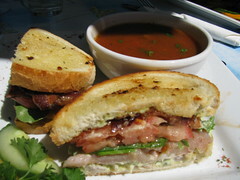 Smoked tuna Clubhouse sandwich with shrimp and avocado aoeli, and with the Shrimp and Wild Mushroom soup of the day. Yum! Deb had the vegetarian hoagie with a caesar salad. Lots of red and orange peppers, mushrooms, and greens. Double yum! This entry was posted in Food & Restaurants, Main Page, Travel reports, Vancouver Area Adventures, Wine, spirits and beer on May 27, 2009 by Todd. Mayne Island is well known for its' sandstone formations which delight kayakers! Todd and Deb paddle past Little Samuelson Island off Mayne Island. It was time for a mini-vacation. We caught the last Thursday night ferry from Vancouver on May 21st, and returned on the 5:05pm from Mayne to Galiano to Tsawassen. We even saw orca/killer whales in Active Pass on the ferry from Galiano to Mayne Island. Deb paddles past some of the fantastic sandstone carved by the wave action of the Georgia Strait. 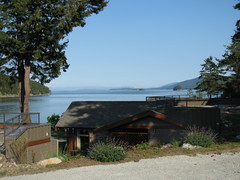 We paddled with Mayne Island Kayaking, located at Blue Vista Resorts. Owner Doug Peers was our guide, and he led us through the currents so we could see lots of harbour seals, a sea lion, oyster catchers, guillemots, and eagles. 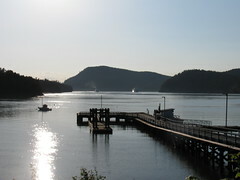 This entry was posted in Main Page, Travel reports, Vancouver Area Adventures on May 25, 2009 by Todd. asking me, because she had an allergy issue. gave a short introduction, and explained how the evening would work. 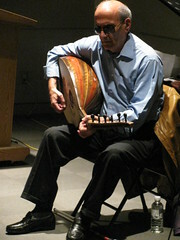 Arabic by Sahaib. Then followed by John's works. We actually started at 7:40, and continued non-stop to 8:40. It was a special magical evening. The audience paid rapt attention. flippings of pages… etc that are at most poetry readings. sounds they understood… like music. 12 songs, as well as improvisation. Awards… for artistic achievement. Lots of audience applause. By reservation and donation only. 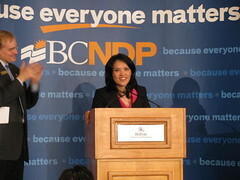 This entry was posted in Main Page on May 20, 2009 by Todd. it has been home over the years to a large population of Scottish immigrants…. 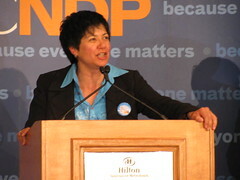 “There are indeed traces of the Scottish Discursive Unconscious at work in Vancouver…. perhaps, that we are all immigrants here at some time in the past. with her 1981 novel Obasan. This entry was posted in Bagpipes, Canadian Identity & Heritage, Chinatown Vancouver, Commentaries, Cultural Fusion, Gung Haggis Fat Choy dinner, Kilts - wearing kilts, Main Page, Multicultural events, Robbie Burns Day, Robert Burns & Burns poetry, Vancouver Heritage and History on May 16, 2009 by Todd. Hapa Izakaya in Kitslano is one of my favorite restaurants. 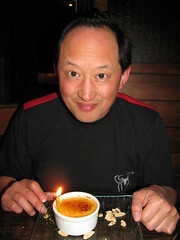 It was a 3 restaurant Kitsilano weekend, last week for my birthday. On Friday we went to Sunset Grill, 2204 York Ave. On Saturday we watched the hockey game and had Slum Dog Pizza at Hell's Kitchen 2041 4th Ave. West. But for the “Big Day” we suggested some names… and eagrely decided to go to Hapa Izakaya 1416 Yew St.
Everytime we go there, the first bite of each dish is either “Wow” or “yummmmmm.” A few months ago, we took a friend from Ottawa to Hapa Izakaya in Kitsilano for his birthday. Good choice! It's a cozy atmosphere with lots of wood, as opposed to the more high-tech “clubby” feel of the Robson St. location. Modeled after Japanese bistros in Tokyo, owner Jason Ault returned from Japan to open up Hapa Izakaya with a fusion twist. As sushi was supposedly invented as finger food to eat while playing games, Izakaya bistros appeared as cheap places to eat and drink after work – but Hapa Izakaya takes it to another level. 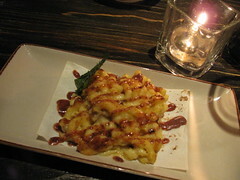 It creates a tapas style menu, with a cultural fusion twist, and sets in a glossy upscale setting. The Robson Street location is always buzzing, while the Kitsilano location is more laid back – but the food is great in both locations. 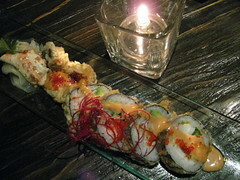 We started with King Crab roll. “Yum” – Deb's favorite! 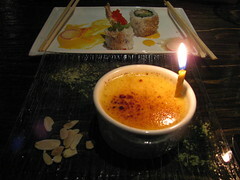 Creme Brule topped off the evening! 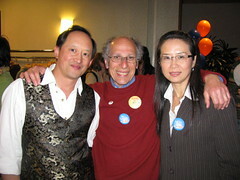 This entry was posted in Cultural Fusion, Food & Restaurants, Hapa culture, Main Page on May 16, 2009 by Todd. Is “Flower Drum Song” an Asian-American version of “Sound of Music” by Rodgers & Hammerstein? Just as the Von Trapp family hiked over the mountains for a chance of freedom from Nazi tyranny, the characters of Flower Drum Song find happiness in the pursuit of the “American Dream” both as immigrants coming to a new country, and as Americans finding their place. The Flower Drum Wong musical (1958) was based on the book by C.Y. Lee (1957), and a movie version directed by Gene Kelly came out in 1961. Richard Rodgers and Oscar Hammerstein had previously written musicals with Asian themes such as South Pacific (1949) and The King & I (1951). Watching the movie versions as I grew up, I was always interested because they had Asian characters and actors. The original musical and movie of Flower Drum Song became considered full of racist stereotypes during the American Civil Rights movement, but like the 1910 song “Chinatown My Chinatown” penned by Jerome & Schartz, it has an affectionate place in the hearts of many North American Asians. Check out this press release from Vancouver Asian Canadian Theatre and buy your tickets! as a full production, during this, the 50th anniversary of the play. keep all of the original language of the play and attitudes of the day intact. more information, including cast and crew bios, please visit http://www.vact.ca. 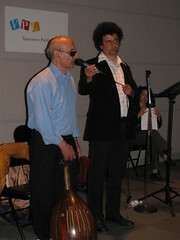 This entry was posted in Cultural Fusion, Main Page, Music, Theatre, Upcoming Events on May 16, 2009 by Todd. will round out his third and final month in residence. 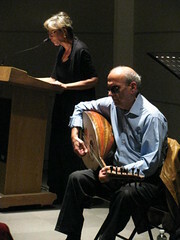 Syrian poet Muhammad al-Maghut and Mahmoud Darwish, Palestine’s national poet. Georgia Street. Admission is free. reserve a seat, please respond to this message. 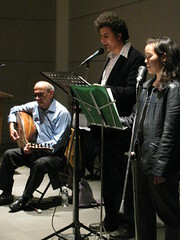 This entry was posted in Joy Kogawa & Kogawa House, Literary Events, Main Page, Multicultural events, Upcoming Events on May 15, 2009 by Todd.